It should come as no surprise that Concordias fittest female athlete is also its best. Lisa-Marie Breton of the womens hockey team was named Female Athlete of the Year at the universitys Athletic Awards banquet, held April 6 at Buffet Crystal in St. Laurent. The Stinger captain was also named as the Fittest Female Athlete for the third straight year. Mathieu Garston, a back with the mens rugby team, was named Male Athlete of the Year. Breton, 23, has been a big part of the womens hockey teams success over the last four seasons. Lisa-Marie is a real workhorse. Shes the heart and soul of our team, said Stingers coach Les Lawton. She brings a real energy to the rink. Breton, a native of St. Zacharie and a fourth-year Sociology major, was the leading scorer on the Stingers and in the QSSF with eight goals and six assists in just six games. 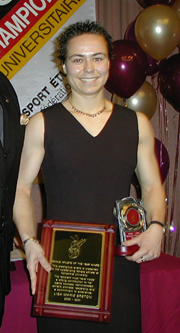 She was a QSSF all-star and a CIAU All-Canadian. She has been a member of the Quebec provincial team for the last three years, and last August was invited to her first national team training camp. Garston, a 27-year-old from Quebec City, was instrumental in helping the Stingers win their second straight QSSF mens rugby championship and winning a hard-fought playoff series with the New Brunswick university champions. The team MVP led the Stingers in scoring with 37 points in six regular-season games. Garston, who won the Dr. Robert J. Brodrick Award for his efforts, is working on a second degree in TESL (Teaching English as a Second Language). As a back and the teams kicker, he was the leading offensive leader, but he was also a key player on defence, barely missing a tackle all season. He was named QSSF athlete of the week on two occasions and was named to the QSSF all-star team the last three years. Last fall, he also won a league championship with the club team, the St. Lambert Locks. Candace Patterson, of the womens rugby team, was awarded the Denise Beaudet Award for leadership, unselfishness and commitment. The fourth-year Human Relations student from Baie dUrfe is a three-time Quebec conference all-star. She also earned All-Canadian honours last year. The Ron Lapointe Award, presented to the graduating male athlete who best demonstrated leadership and commitment to excellence, went to Anthony Brown, of the football team. The fifth-year running back had a 3.76 (out of 4.3) grade-point average in Linguistics and is a member of the School of Community and Public Affairs. Other major award winners include Ricky Martin, football, Fittest Male Athlete; Christian Giguère, football, Male Rookie of the Year; Kathleen Grzybowski, soccer, Laurie Brodrick Award for Female Rookie of the Year. The female and Male Academic Athlete of the Year awards went to Tamara Medwidsky, an MBA student and an accomplished wrestler; and Frank Pons, a PhD student who plays soccer. The team MVPs are Nick Cirino, baseball; Réal Kitieu, mens basketball; Paul Braganza, cross-country; Loan Duong, football; Karl Castonguay, mens hockey; Mathieu Garston, mens rugby; Xavier Renard, mens soccer; Marc Nisbet, mens track; Jason Chen, mens wrestling; Marie-Pier Veilleux, womens basketball; Lisa-Marie Breton, womens hockey; Lauren Arner, womens rugby; Jo-Anne Belair, womens soccer; Crissy McPhee, swimming; Lucie Pierre-Louis, track and field; and Tamara Medwidsky, womens wrestling. And congratulations to Randy Phillips, who has won the 2001 Concordia-McGill Media Award for outstanding coverage of intercollegiate sports at the two universities. This is the seventh time in the past 11 years that he has won the award. He also previously won the Canadian Interuniversity Athletic Union National Media Award. Seven individuals and one team will be inducted into the Hall of Fame at a ceremony on April 26. Congratulations to them all!